15 March, 1517: Needing money to rebuild St. Peter’s basilica, Pope Leo X announces a special sale of indulgences. 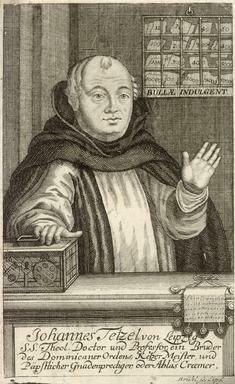 (The remission of temporal punishment still due for a sin that has been sacramentally absolved) A Dominican named Johann Tetzel led the way in promoting the sale in Germany and erroneously declared that indulgences would cover future sins (Leo’s forgave all past sins). The teaching angered the reformer Martin Luther, who soon posted his 95 Theses in response.